Organic. Fine pressed fruit juices. 5 a day - just eat more (fruit & veg). No artificial preservatives. Suitable for vegetarians.Carrot juice is such a wonderful juice, really lively and sweet - a bit of a surprise from a vegetable. 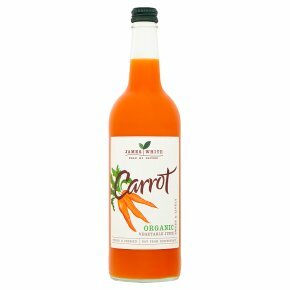 We are really pleased with how our bottled carrot juice tastes, although the taste may vary slightly from pressing to pressing. A glass of carrot juice is a delicious way towards your daily portion of fruit and vegetables.